방향 화합물(芳香 化合物)은 향기가 나는 화합물이다. 일반적으로 휘발성을 띄고 있어 사람의 후각 기관까지 향기를 전달할 수 있도록 되어 있으며, 일반적인 향 또는 향수와는 달리 냄새뿐만 아니라 맛에도 영향을 주며, 일반적으로 방향 화합물은 분자 질량이 300 미만인 것들로 이루어져 있으며, 종류는 크게 자연적으로 발생하는 것과 인위적으로 발생하는 것으로 분류된다. 방향 화합물은 음식, 포도주, 향신료, 향수, 향유, 방향유 등 다양한 분야에서 이용되며, 특히 맛의 풍미를 더해주는 특성으로 인해 식품업에서 중요한 역할을 담당한다. 아니스알데하이드 - 꽃 향기, 달콤한, 산사나무향. 초콜릿, 바닐라, 딸기, 라즈베리, 살구 등의 주요 성분. 감마 노나락톤 코코넛 향, 선탠 로션에 대중적임. ↑ Fahlbusch, Karl-Georg; Hammerschmidt, Franz-Josef; Panten, Johannes; Pickenhagen, Wilhelm; Schatkowski, Dietmar; Bauer, Kurt; Garbe, Dorothea; Surburg, Horst (2003년). “Flavors and Fragrances”. 《Ullmann's Encyclopedia of Industrial Chemistry》 (Wiley-VCH). doi:10.1002/14356007.a11_141. ↑ Gane, S; Georganakis, D; Maniati, K; Vamvakias, M; Ragoussis, N; Skoulakis, EMC; Turin, L (2013). “Molecular-vibration-sensing component in human-olfaction”. 《PLoS ONE》 8: e55780. PMC 3555824. PMID 23372854. doi:10.1371/journal.pone.0055780. ↑ 가 나 Glindemann, D.; Dietrich, A.; Staerk, H.; Kuschk, P. (2005). 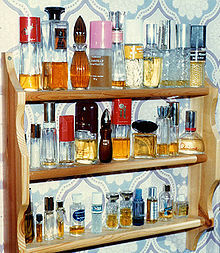 “The Two Odors of Iron when Touched or Pickled: (Skin) Carbonyl Compounds and Organophosphines”. 《en:Angewandte Chemie International Edition》 45 (42): 7006–7009. PMID 17009284. doi:10.1002/anie.200602100. ↑ Block, E. (2010). 《Garlic and Other Alliums: The Lore and the Science》. Royal Society of Chemistry. ISBN 0-85404-190-7. ↑ Lin, D.Y. ; Zhang, S.Z. ; Block, E.; Katz, L.C. (2005). “Encoding social-signals in the mouse-main-olfactory bulb”. 《Nature》 434: 470–477. PMID 15724148. doi:10.1038/nature03414. 이 문서는 2019년 2월 27일 (수) 02:01에 마지막으로 편집되었습니다.